Game of Thrones. As a show, it's epic in its own right and it seems to have people generally polarized as all such shows usually do. Given the investment of time to understand the characters and the story line, it's really not a surprise: You either lovelovelovelove it or you have no time for it at all. Their very own Iron Throne. 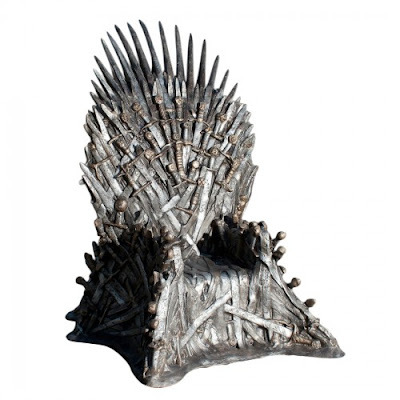 On the show, the Iron Throne was constructed by Aegon I Targaryen, the first king of the Seven Kingdoms. He made it from the swords surrendered by his enemies. Legend has it, it's made of a thousand swords that took 59 days to hammer out into a throne. Can you imagine the shipping costs alone? Granted, this one isn't actually made from iron. This version is fiberglass and is custom-built for every order. Which I would think isn't a huge number since it retails for $30,000. Plus $1,800 shipping. And they hold the order for 48 hours, just in case you have a panic attack and need to cancel. But your superfan is worth it, right? The next season is starting in late Winter 2013 (March 31st). Can you imagine what it would be like to watch it from this? !